Truth be told, I’ve never really had the opportunity to try tofu. It’s always been on the list of things that seem like they’ll be nasty if I tried them, or other people have told me the horror stories connected with it. But, I’ve got a pretty open mind and loved the idea of giving it a try with my own spin on it. 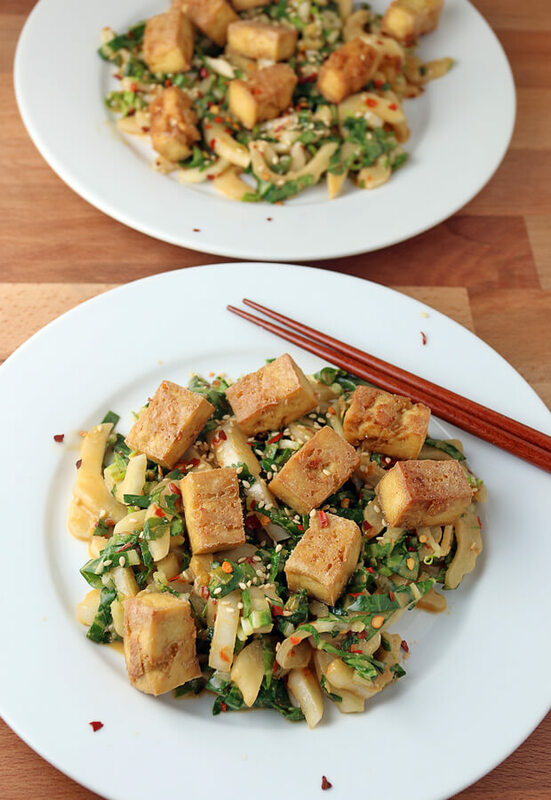 Let me tell you – if you’ve never had tofu, or think you don’t like it…you need to re-try it! Baked tofu is wonderful. Instead of the soft, gooey, flavorless mess that people usually describe, you get a rich and flavorful little cube that has crunchy outsides. It’s almost like adding meaty croutons to a salad – really a joyful experience for me. Bok Choy is something that I’ve had in the past, and not had the best experience with either. The last time I remember eating it was at my brother’s house when he was attempting to make an Asian stir-fry. The bok choy was rubbery and watery at the same time, and made me stay away from it for a few years. But, raw bok choy is fantastic! It’s super crunchy, brings a distinct bitter taste to the party, and really balances out everything in this salad. Not only did I experience a great first time with tofu, I thought that bringing some vegetarian meals to the site might be helpful for those that don’t eat meat. I get requests quite often via e-mail to add more vegetarian recipes, and I’m trying to do it, albeit slowly. Bon apetit! 1. Start by pressing the tofu. Lay the tofu in a kitchen towel and put something heavy over the top (like a cast iron skillet). 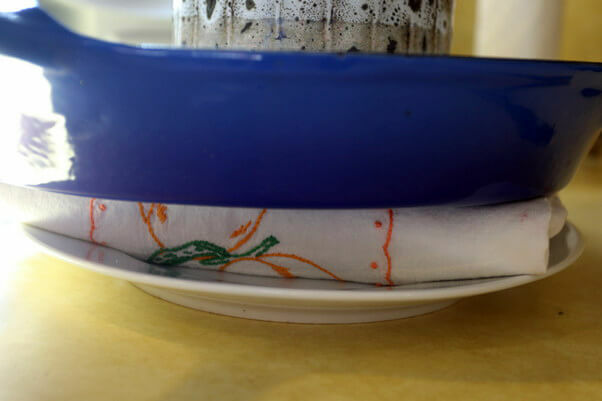 It takes about 4-6 hours to dry out, and you may need to replace the kitchen towel half-way through. 2. Once the tofu is pressed, work on your marinade. 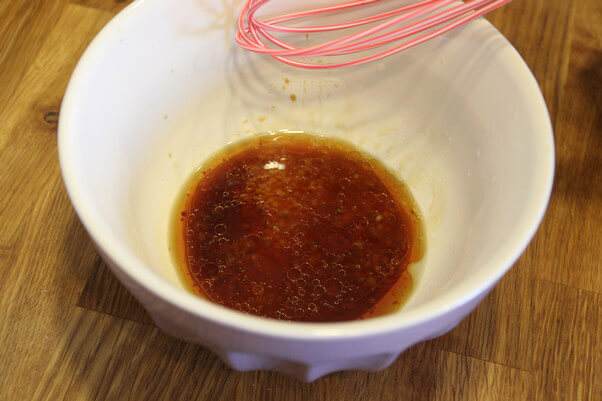 Combine all of the ingredients for the marinade (soy sauce, sesame oil, water, garlic, vinegar, and lemon). 3. Chop the tofu into squares and place in a plastic bag along with the marinade. Let this marinate for at least 30 minutes, but preferably over night. 4. Pre-heat oven to 350°F. Place tofu on a baking sheet lined with parchment paper (or a silpat) and bake for 30-35 minutes. 5. As the tofu is cooked, get started on the bok choy salad. 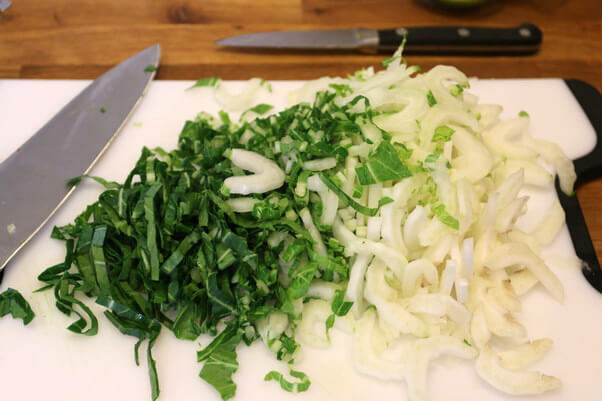 Chop cilantro and spring onion. 6. Mix all of the other ingredients together (except lime juice and bok choy) in a bowl. 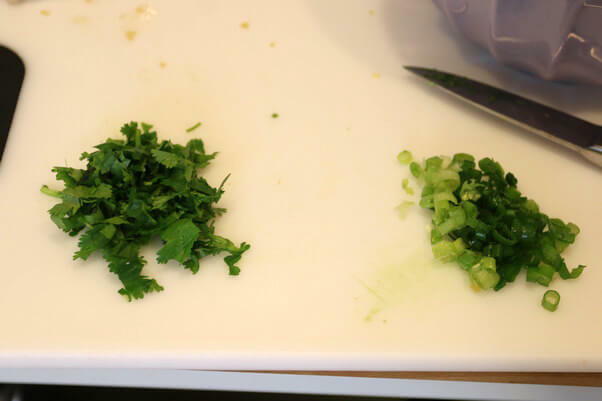 Then add cilantro and spring onion. Note: You can microwave coconut oil for 10-15 seconds to allow it it to melt. 7. 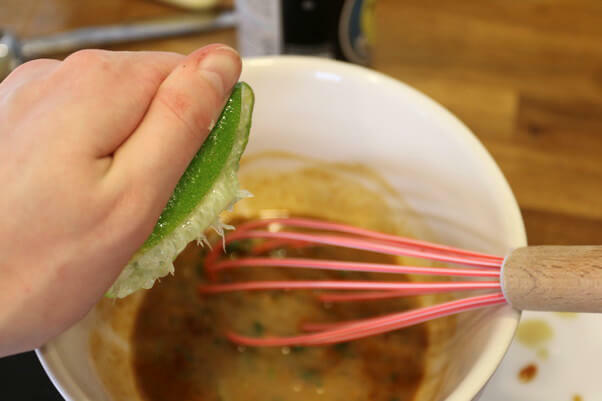 Once the tofu is almost cooked, add lime juice into the salad dressing and mix together. 8. Chop the bok choy into small slices, like you would cabbage. 9. 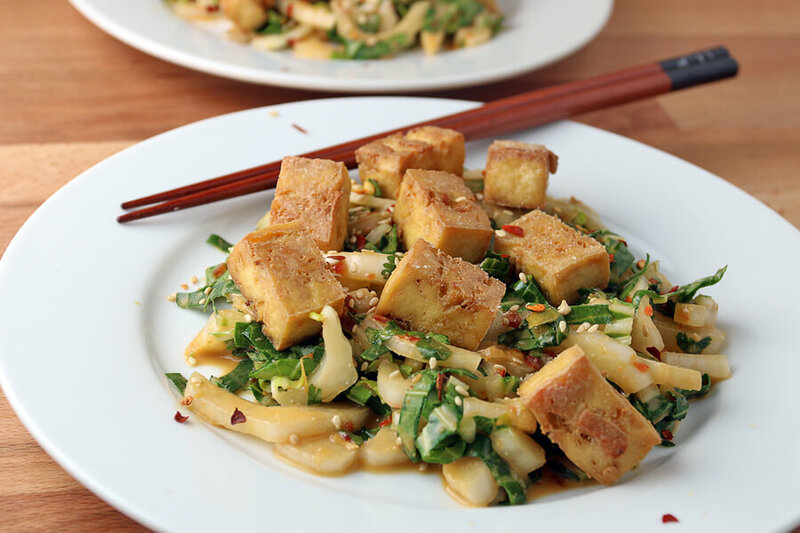 Remove the tofu from the oven and assemble your salad with tofu, bok choy, and sauce. Enjoy! This makes a total of 3 servings of Crispy Tofu and Bok Choy Salad. Each serving comes out to be 398.59 Calories, 30.43g Fats, 6.68g Net Carbs, and 24.11g Protein. Press the tofu dry, about 5-6 hours. 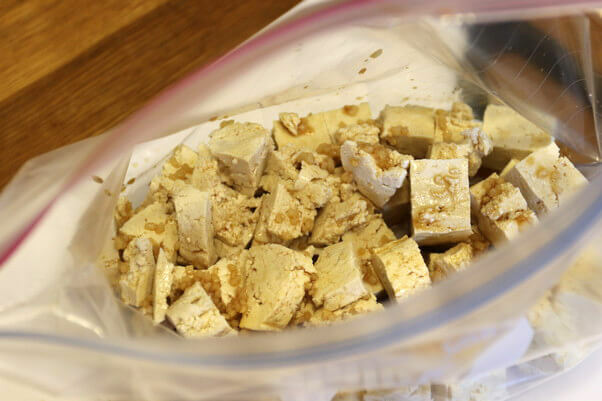 Chop the tofu into squares and place in a plastic bag along with marinade. Let this marinate for at least 30 minutes, but preferably over night. Pre-heat oven to 350F. 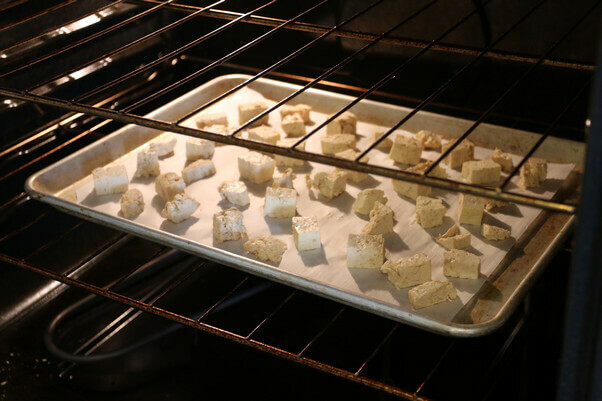 Place tofu on a baking sheet lined with parchment paper (or a silpat) and bake for 30-35 minutes. 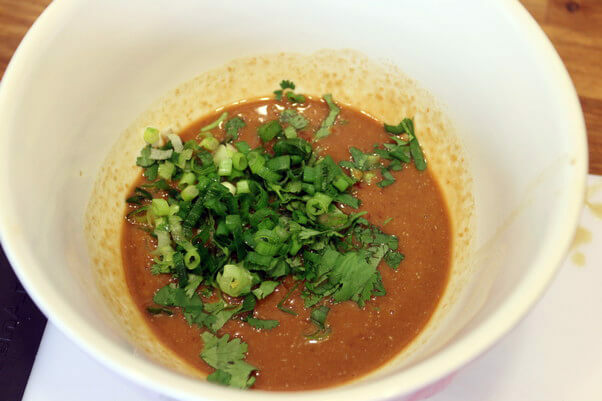 Mix all of the salad dressing ingredients together (except bok choy) in a bowl. Add cilantro and spring onion. 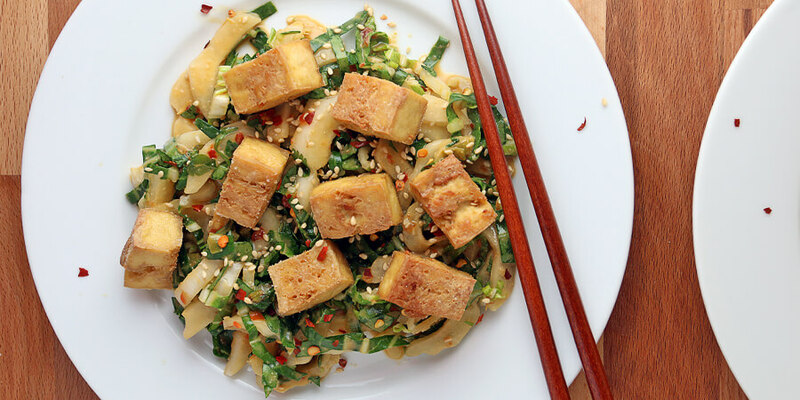 Remove the tofu from the oven and assemble your salad with tofu, bok choy, and sauce. Enjoy!